My name is Brent Grablachoff and I’m a professional football kicking coach and the Owner of Kicking World. I originally designed the Kick Tracker App for my students to help them track, analyze and learn from their kicking stats to help improve their field goal kicking, kickoffs and punting skills. After a beta test we found the Kick Tracker App to be not only fun to use, but also extremely effective at helping to improve their overall kicking game. We then decided to release this wonderful app to everyone through Google Play and the App Store. Kick Tracker is the first of its kind and the best football kicking app for the iPhone, iPad and Android devices! 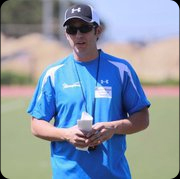 Brent Grablachoff is a renowned kicking coach based in Austin, TX with a national presence. Brent trains kickers and punters from as early as 9 years old and helps high school specialists get into college and college kickers get into the professional ranks.